« Lots of Morning Wading Time! We did have the warmer temperatures over the weekend, but standing in the water, it was pleasant. Today, we are expecting 80s. This will creep up so that by the weekend, we will be in the low 90s. Very little chance for moisture currently showing up in the forecasts with temperatures back into the 80 next week. Wonderful! The past seven days, we have seen no generation in the mornings. Last week, they would crank up 2-3 units for 5-7 hours in the afternoon. Over the weekend, they only ran the equivalent of one unit for 1-2 hours. Yee ha! Lots of time to fish! Last really tough day we have seen was last Thursday, Stan had Bryan from Texas on the water for half a day. Flat, clear water required 7X on midging. It was a black zebra with the copper head midge morning. Friday, Jim took Chris and his son, Garrett out for half a day. Garrett is new to fly fishing (ten years old), so Jim put a size 12 olive wooly bugger on Chris and sent him on his way while he worked with Garrett. Dad was catching them on the wooly bugger and once Chris got the hang of it, it caught some on the P&P with a blood worm dropper. Larry, from Kansas, spent Saturday morning on the water with Stan. Good day for Larry on the P&P midge and stripping a holographic green crackleback. I fished Saturday and eventually, Debbie from Springfield showed up and fished with me until the generators came on. We had a great, fun day catching on the holographic green crackleback and the size 8, olive CQ streamer. We were fishing both of these on the 2.6 ips sinking leader. Lots of nice quality fish. Sunday, Mike, from Texas, fished with Stan. He had just finished the 1-day school at Dogwood and wanted to get some practical experience. Brushed off a few cob webs and he had a very good day on the black zebra midge with the copper head as well as stripping a size 14 olive wooly bugger on a sinking leader. It rained off and on (mostly on) that morning, but catching made that a mute point. 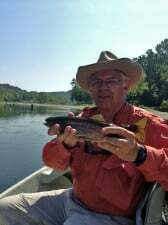 This entry was posted on Tuesday, September 3rd, 2013 at 10:32 am	and is filed under Fishing Reports. You can follow any responses to this entry through the RSS 2.0 feed. You can leave a response, or trackback from your own site.